The unpredictable nature of life for a band with members scattered around the globe have forced Guts to give his line-up a shake to start their various tours in the best possible conditions. A Brand New Revolution! So Leron Thomas gave way to Wolfgang Volburn, who is also lead vocalist of The Ephemerals. Mary May climbed onto Lorine Chia’s throne. Beat Assailant plucked a mic from the air that was still burning from the flow of Von Pea. While Florian Pellissier remains riveted to the keyboards, versatile Greg F. on the bass and Nico Rajao on drums, Guts has gobbled up the miles and bestrode stage after stage at the head of a revitalised live band. New recruits had kept enhancing the well-practised repertoire with their vibes, redefining some of the contours, adding a bit more soul here or a lightness of touch there. Their impact was so great, in fact, that changing line-ups have become part of the band’s identity. 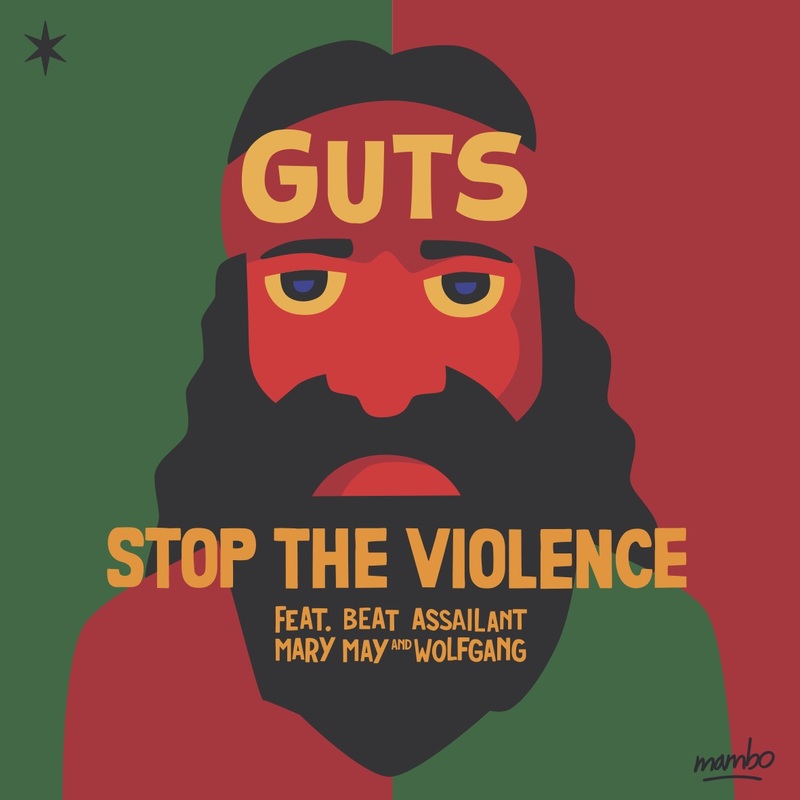 Galvanized by this new alchemy, Guts and his new-look live band stopped off in the studio to compose and record some new tracks which he has brought together on “Stop the Violence”, a five-track record that’s more like a mini-album than a simple EP. High on this regenerating juice, energy levels spiking into the red, “Ain’t Perfect”, “Pick Me Up”, “Everybody Wants to Be a Star”, “Drummer’s Delight” and the title track light up boxes marked soul, afro, disco and jazz, brighten a groove carpeted with retro-funky keyboards and the brass of Cotonete, Heavenly Sweetness’s resident jazz-funk specialists. Two birds with one stone, since Guts and his live band will obviously use “Stop the Violence” to set the stage ablaze after burning up people’s decks.